Knit a Cable. Video Tutorials. To knit a cable is easy. In order to knit a simple 2-strand cable, we would take a group of stitches (1, 2, 3, and sometimes more then 3 stitches ) and at certain rows of knitting we would change their places on the knitting needle with other group of stitches (1, 2, 3, and sometimes more then 3 stitches ) . This way two strands overlap each other at certain points and pattern results in a cable. (see the picture below). Knitting a cable is a very popular and pretty easy way to make your garment looking not like every body Else's. It can be easily modified and adjusted to your own design. Just play with those neighboring groups of stitches and the final result will look great. How can we do that? use 3 or more strands instead of 2 strands. Three strand cable will look like a braid. vary the length of different sections of a cable. Additional pattern based on irregular length of those sections will be noticeable. With the aid of the additional needle. It can be a specially shaped cable needle, a double-pointed needle or just a large safety pin. Without the aid of the additional needle. Cable knitting without an extra needle will make your cabling experience much more enjoyable. Not having that pesky cable needle, you will easily visualize a cable pattern and your knitting process will be much more productive. If you are a visual learner, the videos presented here will be the best help for you to be prepared for mastering any pattern designed of braids and cables. Let's watch and follow tutorials. 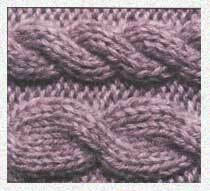 More videos about advanced methods of knitting can be found at the bottom of the Knitting Video page.